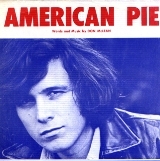 Don McLean was born in New York on 2nd October 1945 and would have been just over 13 years old when the tragedy occurred, so it’s quite feasible that the events he was singing about were from his personal memory, but unfortunately, Don doesn’t really remember and never really liked to talk much about the song. On numerous occasions when he’s been asked what the song means, his stock reply is usually, “It means I don’t have to work again if I don’t want to. Many have tried to analyse the song and Don has never really agreed nor disagreed. In 1972 he once said, “I can’t really interpret the song any better than you can.” But if we look at it closely, we can probably ascertain that the jester was Bob Dylan because it refers to him wearing ‘A coat he borrowed from James Dean,’ and on the cover of The Freewheeling Bob Dylan, Dylan is wearing a red jacket similar to James ‘And a voice that came from you and me’ may well refer to the folk style he sings, and the line, ‘And while the king was looking down the jester stole his thorny crown’ could be about how Dylan took Elvis Presley’s place as the number one performer. The line ‘And while Lenin read a book on Marx’ most likely refers to the communist dictator, Vladimir Lenin, who led the Russian Revolution in 1917 and who built the USSR that was ruled by Josef Stalin. The ‘Marx’ is Karl Marx, but some have made comment that they think it’s about John Lennon, whose songs often reflected a very communistic theology, especially Imagine. If that is true then the Marx must surely be Groucho, another cynical entertainer who was suspected of being a socialist, and whose wordplay was often similar to Lennon’s lyrics. ‘Did you write the book of love’ is probably a reference to the 1958 hit Book of Love by the American group The Monotones. The chorus for that song goes ‘Who wrote the book of love? Tell me, tell me, I wonder, wonder who, who wrote the book of love’ another line asks, ‘Was it someone from above?’ Don was a practicing Catholic, and believed in the depravity of sixties music, hence the closing lyric: ‘The Father, Son, and the Holy Ghost’ they caught the last train for the coast, the day the music died. the lyrics of Buddy’s own song Early in the Morning, which is about his ex missing him early in the morning when he’s gone. In the US, there was no radio edit and the radio stations played the full eight minutes and 30 second version, but of course, that was no good for British radio, so it was cut onto two sides of a single with part one fading out after four minutes and 10 seconds and then fading in on the B-side where the story continues. In the USA it made number one and stayed there for four weeks but in the UK it peaked at number two for two weeks behind Nilsson’s Without You. Don, himself, was once the subject of a song too. In 1971, a singer named Lori Lieberman saw McLean perform this at the Troubadour Theater in Los Angeles. She claimed that she was so moved by the concert that her experience became the basis for her song Killing Me Softly With His Song, which she took to the writers Norman Gimbel and Charles Fox and after she’d explained how it made her feel they then put it into words and music and later became to massive hit for both Robert Flack in 1973 and the Fugees in 1996. The song appears in a few films including Born on the Fourth of July (1989), Celebrity (1998) and Josie and the Pussycats (2001). Don’s original manuscript of American Pie was sold for $1.2 million at a Christie’s New York auction in April 2015. McLean wrote this for the catalogue description: ‘Basically in American Pie things are heading in the wrong direction. It is becoming less idyllic. I don’t know whether you consider that wrong or right but it is a morality song in a sense. I was around in 1970 and now I am around in 2015. There is no poetry and very little romance in anything anymore, so it is really like the last phase of American Pie.